of the heralds, caught flash of lance and sword and the tossing manes of many horses. Even from this distant hill young Wulfric could see that a tremendous force of Norman invaders was crossing the East Anglian fens and the pitifully small gathering of English soldiers under their leader Hereward could stand no chance of survival. Young as he was Wulfric, son of the miller, saw in these oncoming horses the end of England and the English way of life. And the end of Hereward The Wake who, until now, had held out so valiantly against the Frenchman, protecting first his father Lord Leofric's lands in the Lincolnshire wolds, and now the remnants of English resistance in the fens of Lynn and Ely. Wulfric, a tall, fair lad of sixteen, turned his woeful gaze from the soldiers below to the distant outline of Ely abbey standing on its island amid marsh and fen... how long would that English flag remain above it? What would be the fate of the defenders who had brought such confusion on Duke William's armies in the past that The Conqueror had sworn to wipe them out? Wulfric did not dwell long on the problem, for he had a job to do and that swiftly. Taking a disc of polished steel from his smock pocket he turned it obliquely into the sun and towards the distant abbey of Ely. Then with his other hand he covered it, three times, finally slipping it back into his pocket. With his eyes steadfastly on the grey outline of the ancient building he was soon rewarded by the arranged signal. The flag was lowered and raised again. Hereward The Wake knew that danger threatened and even now on that small fen island the bowmen would be mustering. Wulfric's next task was to return as quickly as he could and make his report. Turning once more to make an estimate of the enemy's strength, Wulfric was suddenly dismayed to see that a detachment of armed men had left the main force and were heading his way. Careful as he had been, somebody had caught the gleam of his warning signal and the alarm was raised. Now Wulfric knew that he had a tremendous advantage over his pursuers; like his father who had died in the defence of Bourne, he knew every swamp path, every tree and every bush in the flat water‑logged lowlands. These marshes lay like a moat around the Isle of Ely and it was this formidable barrier which had so far kept the Norman armies at bay. How they hoped to cross it now Wulfric did not know, but there was always the possibility that they had as a guide some renegade Englishman, or some unfortunate fenman who had been forced to betray his country­men and show them the secret paths. On the other hand it might well be that they had no such knowledge and were anxious to capture somebody who would lead them to the island. Wulfric therefore dare not run directly for the path which would take him on the shortest route to the island, for there was the danger of betraying that path to the Normans who were only a few hundred yards behind him. Instead the lad headed for a copse of alder trees which stood some distance away across a field thick with reed and thistle. He was no more than half­way across this field when he heard the triumphant cry of a soldier behind him and then the pounding of hooves. Wulfric was burdened with a long vaulting pole which all fenmen carried in these parts, but he dare not cast it aside. He knew that the path he intended to follow through the marsh would come to an abrupt end and he would have to vault some ten yards of water to reach a conti­nuance of the path on the other side. This is where he planned to lose his pursuers. But disaster came when Wulfric had almost reached the alder trees marking the beginning of the path. 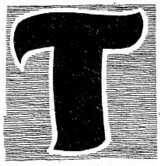 His foot caught in a clump of thistles and he fell headlong. Even as he rolled over the band of Norman horsemen was upon him and the leader, a dark, bearded officer wearing a mail coat, looked down at him. In that same instant one of the French soldiers drew his sword and brought it flashing down towards Wulfric. The lad instinctively raised his vaulting pole in both hands, taking the blow on the hard wood and then wrenching the sword from the furious man's hand. The soldier, cursing in his own language, sprang from the saddle and leapt upon Wulfric with a long‑bladed dagger. 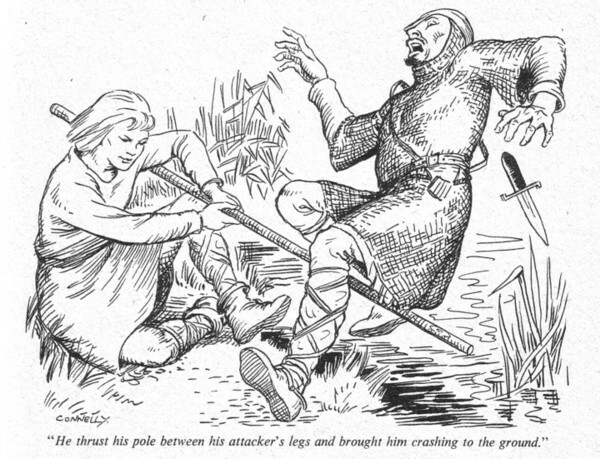 Wulfric was now on his knees and still using the pole as skilfully as only fenmen know how, he thrust it between the attacker's legs and brought him crashing to the ground. "Enough!" the officer cried, in English. Then in French he commanded the soldier to re­mount. The man did so, sheathing his sword and dagger and looking far from cheerful. The officer looked down at Wulfric. There was a good deal of admiration in the smile he bestowed on the boy, but Wulfric had no answering smile for him. "I see you know how to look after yourself, lad," the officer said. "Come boy," the officer exclaimed, "why so surly? We are friends. I seek audience with your leader Hereward... can you take me to him?" At this Wulfric snorted. "You and your army?" "There are but six of us," the officer said. "The army is still a mile away and more." Wulfric eyed the officer, resentfully: "Once you know the path the army will not be long in coming, I warrant!" The officer lost his smile at once. "Aha! So there is a path hereabouts! Then you shall show us this path, whether you like it or not... start walking!" And so saying the officer prodded Wulfric with the point of his lance, a cruel blow which sent the lad staggering forward towards the alder trees. This was a desperate moment for the boy. Once these Normans knew a path across the marsh then Hereward the Wake was finished, and with him England's last hope of survival. 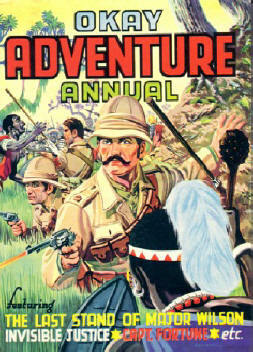 Could such a dreadful calamity rest on the shoulders of a humble miller's son? Wulfric prayed he would find the strength to die rather than show these soldiers the way to the Isle of Ely. "Stay close behind him and watch where he treads," the officer commanded, "this rabbit knows a few holes 1 would say!" Hearing this Wulfric lost some of his terror and began to use his brain. It was true; although captive, he still had an advantage over these strangers. Now they were riding in single file behind, him through clumps of elder and tall rushes, their horses cautiously treading the soft green turf in his footsteps, and strange though it may be they were in his power as much as he in theirs. One step either side of this narrow path would plunge them into a morass from which they would have the greatest difficulty in extricating themselves. "Mon dieu! The path winds!" One of the soldiers had allowed his mount to side‑step and its hoof had sunk into mire causing it to rear and plunge until it found a safe‑footing. The officer laughed. "Even so we cannot see the abbey and so they cannot see us... it is a good path for our purpose." And it's a good path for my purpose. Wulfric thought, as he trudged on. Never had he been so calm, yet he was trembling at the audacity of his plan. He was no longer planning merely to confuse these soldiers, he had a far greater scheme in mind, one which would, if it succeeded, be of tremendous tactical advantage to the besieged Englishmen. It must succeed! "Hold now boy!" the officer called at last. "We have come far enough... see, there is the abbey, scarce quarter of a mile away!" His heart beating fast, Wulfric stopped walking and turned to face them. He said: "You can­not go that quarter of a mile unless I lead you." "All in good time, boy," the officer said. "First you will lead us back to join the main army... it's hardly fitting that six of us should present our compliments to the great Hereward!" The soldiers laughed. But not for very long. Wulfric began walking backwards away from them and towards the isle. "Stop!" The officer spurred his horse after him. Wulfric did not attempt to run, but continued his slow walk away from the officer. He was banking everything now on his knowledge of this path. And suddenly he felt his feet sinking into soft turf. His calculations were right, he had reached a patch of marshweed which could only barely stand his weight. Suddenly the officer's horse reached it too and was up to its fetlocks in oozing slime, catapaulting the officer over its head. The man landed on his back in a pool of water and when he emerged was covered from head to foot in the blackest of black East Anglian mud. Unable to do anything else but splutter he set to pushing his horse back on the firmer path where his men were waiting, helplessly. When at last the officer turned to look at Wulfric, the boy had gone and they could hear the faint splash of his footsteps as he ran along the wet path and above that they could hear his laughter. The Normans looked at each other, dismayed and bewildered. "What now?" a soldier said. "Back," spluttered the officer, his eyes blazing through the mud on his face, his mouth spitting weeds and water. "How?" said the soldier, dolefully. Wulfric climbed the firm woodland path from the fen onto the Isle of Ely. Above him the towers of the abbey stood out against the sky and the flag fluttered against a crimson sunset. Halfway up the path an arrow whined close to his head and stuck quivering into an oak tree. Wulfric knew the accuracy of an English archer too well to take alarm. He stopped and waited, as the arrow had requested. A man stepped out from behind a tree further up the path. “It's me," the boy cried. "Wulfric of Bourne. I have news for Hereward The Wake!" Soon the boy Wulfric was in the company of the greatest man in all England, rightful Lord of Bourne and Earl of all Mercia, whose lands had extended from Humber to Thames until Duke William of Normandy brought his forces to defeat King Harold at Hastings twelve months ago. Tall, fair‑haired, massively broad of shoulder and with that curious discolouration in the left eye which bade no mistake that his was indeed The Wake, whose deeds on land and sea as soldier and Viking had brought him fame and fortune. Now, standing with his uncle the Abbot Leofric of Ely, he looked down at the young lad and smiled. "You have done well, Wulfric... your father would be proud of you." The boy lowered his gaze, his heart heavy at remembrance of his father and the mill home at Bourne. Hereward understood the boy's feelings and shared them, for his castle at Bourne was also in the hands of the invader. "Do not be sad, boy," Hereward said. "The day will come when our lands will be free again and you shall be master of your father's house." The old Abbot broke in, impatiently: "What can we do? Even now the Norman army masses across one bare mile of fen... how will they come? And how shall we repel them if they do with no more than three hundred archers against two thousand fully armed soldiers?" "Don't fret uncle," Hereward said. "The boy may well have given us the answer.” He turned to Wulfric. "Now... can you lead me and a score of men to these Normans which you've bogged down so successfully?" “Indeed I can, sir," Wulfric said. "They are no more than half‑an‑hour's journey from here..."
In the darkness twenty men headed by Hereward and Wulfric left the island town and headed into the fens. When they were near to that spot where the boy had stranded the Frenchmen they broke up into groups of five, each group led by a man who knew the fen paths as well as Wulfric himself. Slowly they closed in on the Normans who, afraid of the treacherous fens and even more frightened of the English, were huddled together with their horses, waiting for the night to pass in the hope that they would be found by their own army. The first they knew of the Englishmen's presence was when a well‑placed volley of arrows whistled just above their heads. The silent night was broken by exclamations of fear. Then Hereward spoke from a little distance. "Throw down your arms and we shall spare your lives! " he called. The French officer replied: "Come and take us!" “We will that," Hereward said, "what a boy can do we can do better, for he now has a score of friends." "That brat!" the officer exclaimed. Hereward said: "I will count five after which our shafts will be at your throats. One... two..."
He was interrupted by the sound of several swords and knives and various armoury clanging together as they struck the ground. "All right, men," Hereward cried, "move in!" Wulfric at Hereward's side, said: "Have a care, sir. I don't trust them." Hereward strode boldly forward but Wulfric slipped past him and was first amongst the Normans. And it was WuIffic who took the blow from the French officer's sword which would have slain Hereward had he been in the lead, for it was aimed at a man's throat but it took the boy across the scalp laying open a painful wound and rendering him unconscious. The next instant Hereward had lunged such a blow with his lance that the Norman officer once again went flying into the black marsh and was rescued only just in time to save his fife. "If the boy dies," Hereward told the Frenchman, "then you shall hang." The Normans were taken back to the garrison camp on the Isle of Ely and Wulfric was carried to the abbey where one of the monks tended the wound. When the boy recovered consciousness it was already daylight. For several minutes he lay on the bed trying to remember what had happened and wondering where he was. Then slowly he realised that the men clustered at the window across the room were monks and he knew that he was safe. His head was bandaged, but was not hurting him. He sat up and the monk who had been tending him turned away from the window. "You must sleep young soldier," the monk said. "You have had a very narrow escape." Wulfric smiled. "I have slept... see, it's daylight. What is happening out there?" Another monk, engrossed in whatever was going on outside, spoke over his shoulder. "Noth­ing is happening, that's the strange thing. Our soldiers watch while the French prepare to invade us..."
Wulfric got off the bed, waving aside his attendant's protests. He walked over to the narrow slit aperture which overlooked the island on the south side. What he saw puzzled him greatly. The monk was right. The English archers stood rank upon rank along the south side of the isle overlooking the fens. On the far side of the fens, no more than a quarter of a mile away the Norman army was mustered in full strength. Then, looking more closely, Wulfric could see that there was great activity in the area immediately beyond the armed men. Something was going on, something was being done over there and with great haste, but Wulfric could not determine what it was. "I must go down and find out!" he said. A deep voice behind him replied: "You will stay here and find out!" "Not if you have a better plan, sir," Wulfric said. "And I think you must have." "Wisely said," Hereward told him. "Thanks to you we have a better plan. Thanks to your Normans, who talk readily on English ale, we know exactly what their army is preparing." Wulfric said nothing, but his face asked the question. "A bridge," Hereward told him. "A bridge that floats on water and marsh, over which their horsemen can ride to attack us." "It's not erected as a bridge is erected," Hereward said. "It's no more than a long raft floating on inflated cattle hides... it will be pushed across the water in three or four sections." Wulfric saw the possibilities of this immediately and his face clouded. "Then attack them before they've prepared it!" he said. Hereward shook his head. "That won't help. They will take longer to prepare it, but in the end it will be ready... and we shall have lost many of our precious men." "Then what can you do?" Wulfric; asked. 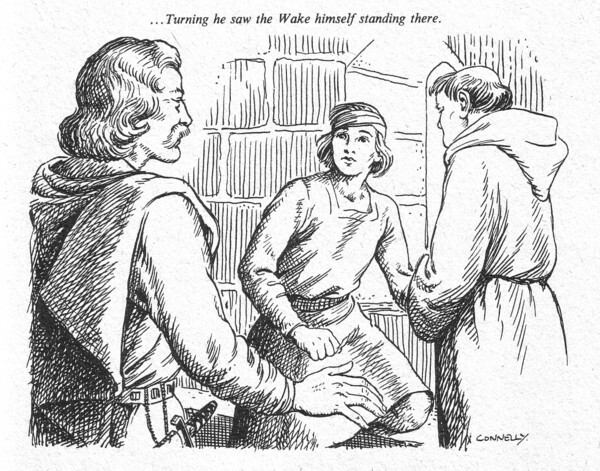 Hereward walked to the door, then turned to face him. "Wait and see," he said. All that day Wulfric watched and waited and nothing happened. The Normans beyond the strip of water‑logged fen worked on at their bridge, the English archers stood waiting. When nightfall came at last Wulfric was filled with the gravest doubts of what might happen under cover of darkness. 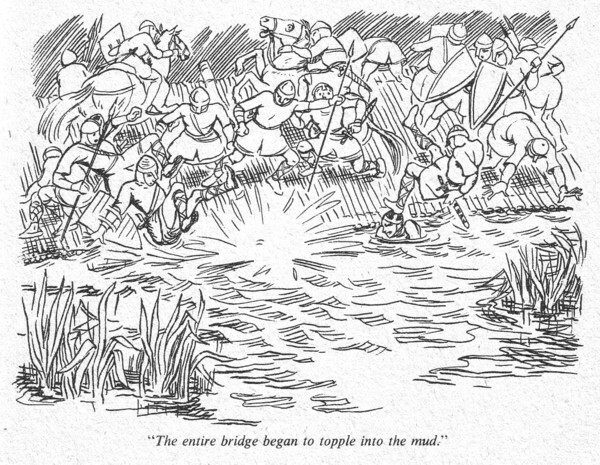 Now, assuredly, the Normans would launch their bridge and what could the defenders do then? Suddenly a sharp order came from somewhere outside and Wulfric recognised the voice as Hereward's. Now the boy peered down into the night but could see nothing. Then he was startled by a burst of flames down in the fen... a torch? No, there was no torch as big as this one. Then another light appeared in the fen, and another and another. "The reed beds are afire!" Wulfric called out. Monks of the abbey came crowding around him, staring out on the scene. It was indeed true. English fenmen had taken to the fen paths under cover of darkness and had set fire to the tinder-­dry beds of reed which grew to a great height and were topped with millions of white feather 'dusters'. The flames illuminated all the south side of the island... and in that great yellow light Wulfric saw what was happening. The Normans had pushed their bridge across from one side of the fen to the other and already it was crowded with hundreds of armed men and horses, all surging across towards the isle. Now another order came from Hereward, who, Wulfric could now see, stood at a point directly above the bridge. There came that sudden whang of three hundred bowstrings drawn in unison and in the light of the fire, through smoke and flame, three hundred arrows sped towards their mark. Wulfric flinched, not relishing the scene of death which must surely follow. But no! Now he saw Hereward's plan. The arrows were not aimed at the Normans, but were slicing into the blown‑up cattle hides which gave the bridge support on water and bog. From where Wulfric stood in the abbey he heard the escaping air as hundreds of these hides burst. And then amid the outraged cries of the Frenchmen and the cheers of the English, the entire bridge began to topple into the mud... and with it went the cream of the conqueror's proud army. Within minutes hundreds of men and horses were floundering through black muck and foul mire for the nearest shore... friendly or enemy. Those that came out onto the isle were taken prisoner, nor were they in any mood to fight... they'd lost their weapons anyway. Never before had such humiliation been inflicted on Duke William of Normandy. And to cap this triumph, amongst those captured in this dirty and bedraggled state was the knight Ive Tallebois, second in command to William himself and leader of this expedition into East Anglia. Here was a hostage which Hereward could use to inflict the severest terms on the invader... which, in the end, he did, recovering his own lands and titles and restoring the rights of his countrymen in the legislation which followed, and which men now know as Domesday. But to Wulfric of Bourne went the credit for making this great victory possible and when Hereward the Wake was finally restored to his Earldom of Bourne and Mercia, Wulfric was knighted for his services to England.